Washington DC - This just in from the the 35th running of the Marine Corps Marathon on Halloween morning...Jon Megeff runs 2:49, Mark Shalvarjian and Rich Gust run 3:00...these are unofficial chip times and may be adjusted as the day goes on. Mark says he never saw Rich in the race...Rich says it got hot at the finish. Megeff is probably out for a cooldown 10-miler, and could not be reached for this update...More later! 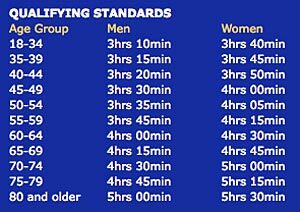 Does the Boston Marathon Need Faster Qualifying Times? The 2011 Boston Marathon had 22,000+ entrants in one day to run 26 miles in April 2011. Does this suggests changes (faster qualifying times or larger fields or both, and other things) are probably in store for 2012? This also means that you better have a qualifying time by October 2011 if you want to run Boston in 2012. Runners were allowed to start signing up for the 2011 marathon at 9 a.m., and the registration window closed just after 5 p.m., meaning about 21,000 people filled out their forms in eight hours. That's 65 times as quick as last year and more than 200 times as quick as five years ago, when it took almost seven months to fill the same number of spots. Here's how long it has taken, since 2006, for the Boston Marathon's field to fill up. Correct Prize Money: Open - $350, $150, $100, Masters (40-49) - $200, $75, $50, Masters (50+) - $200, $75, $50. Detailed rules here. The winning men’s and women’s open teams will earn a $500 travel stipend for travel to the 2010 USATF National Club Cross Country Championships in Charlotte, N.C. The Grand Prix features $2,500 in prize money, to be awarded in three divisions: open runners, masters (40-49) and masters (50+). To be eligible for prize money, runners must compete in 2 preliminary races, and the final Association Championship race at Huntington Beach Central Park. 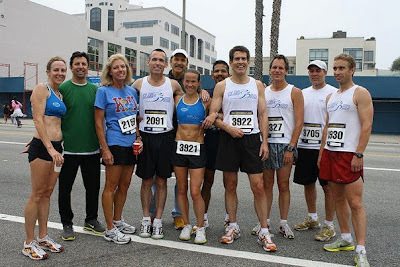 USA Track & Field Southern California Association is proud to announce the launch of a new 2010 Cross Country Grand Prix series. The five-race series kicks off this Sunday, October 17, 2010 at the Free Spirit Cross Country Invitational, at Mount San Antonio College (Mt. SAC) in Walnut, CA. With 62 years of history, the Mt. SAC Cross Country Course is one of the oldest and most famed courses in the world, challenging generations of runners against each other. This is a challenging course over asphalt and dirt trails with flat and rolling hill combinations, plus switch backs and tough hills. The Open and Masters Cross Country race will start at 7:30 a.m. before the youth competitions. Medals will be given to 1st thru 8th place overall. Athletes can register on race day for $10. Mt. SAC is between the Pomona and San Bernardino Freeways and west of the Orange Freeway (57). Click here for directions to Mt. SAC. The Grand Prix provides a total of $2,500 in cash awards to Open and Masters runners. To be eligible for Grand Prix prize money, runners must compete in a minimum of two preliminary races, plus the final Association Championship race on 11/13 at Huntington Beach Central Park. The USATF Southern California Association Cross Country Championships (November 13) is part of the USATF Open Club Cross Country Travel Grant Program. The winning men’s and women’s open teams will earn a $500 travel stipend for travel to the 2010 USATF National Club Cross Country Championships in Charlotte, NC.